As we speak, I am simultaneously potty training a two year-old and a four year-old. Littlest is ready, I think. She has been removing her own clothes and telling me she needs to go for a few weeks. Biggest… well Biggest is another story. His ASD means that we have been struggling with this for a two years and counting. We are making a last-ditch attempt before school. So far, things are going as well as we might have hoped. When you are being double-teamed by two novice potty-users, you better make sure you have a lot of cleaning products to hand and a washer and dryer poised to be in constant action. 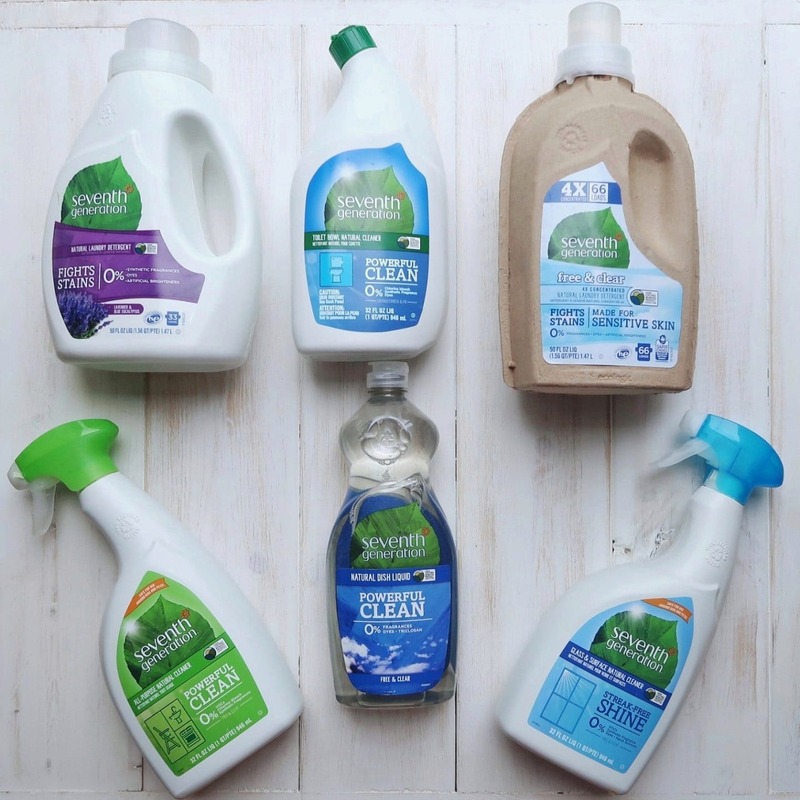 When Seventh Generation offered to send us a hamper of their brilliant, eco-friendly and all natural cleaning products to try, it seemed like pretty excellent timing. Seventh Generation are a brand from the USA who have been making safe, plant-based products that really work for more than 25 years. That is great news for the planet and for those who are worried about using harsh products, particularly parents and those with sensitive skin. They sent me a huge hamper of goodies and FIVE lucky readers can win the same. Just check out the Rafflecopter at the end of this post. 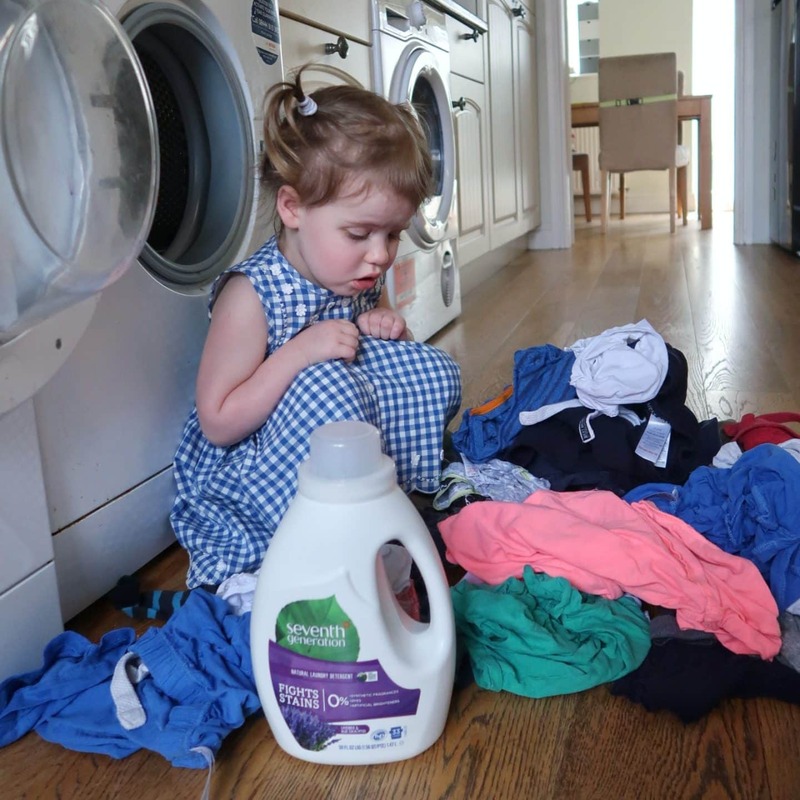 We tried out Seventh Generation laundry detergent, Natural 4 x concentrated laundry detergent, toilet cleaner, all-purpose cleaner, washing up liquid (dish soap or liquid in the USA!) and glass and surface cleaner. One of the great things about these products is that many come in Free & Clear options. This means that they are strong enough to get the job done but they contain no harsh fumes or fragrances. My washing machine has done approximately twenty loads of laundry since we started potty-training four days ago. This means we have had ample opportunity to try both the Blue Eucalyptus and Lavender and the Free & Clear laundry detergent. I was pretty impressed with both. They coped well in my usual washing temperatures and lifted stains as well as coping with all our potty mishaps. I think this is something most people worry about when choosing less harsh, all natural cleaning products. Will it actually do a good enough job? With Seventh Generation, I think the answer is yes. The cleaning spray has been great at cleaning up floor-based accidents and general toddler mess. The fact that it genuinely has no smell but still cleans is a huge plus for me. I am really sensitive to smells. I particularly dislike the synthetic, floral or citrus-type fragrances that cleaning products usually have. This means I sneeze a lot when cleaning. I also hate it when the smell lingers on my hands when washing up. The cleaning spray and washing-up liquid are genuinely odourless and I really appreciated that. 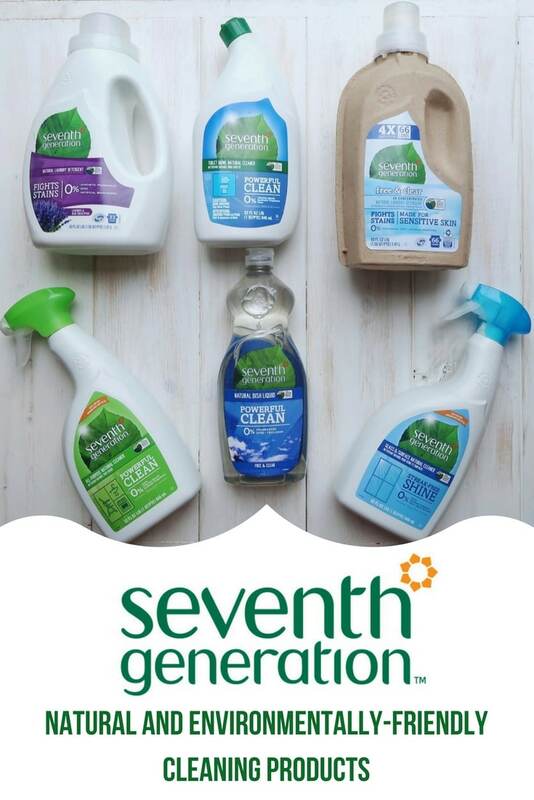 Overall, I think Seventh Generation products are the perfect choice for those who are environmentally conscious or those who are reluctant to use harsh smells and chemicals when looking after their family. 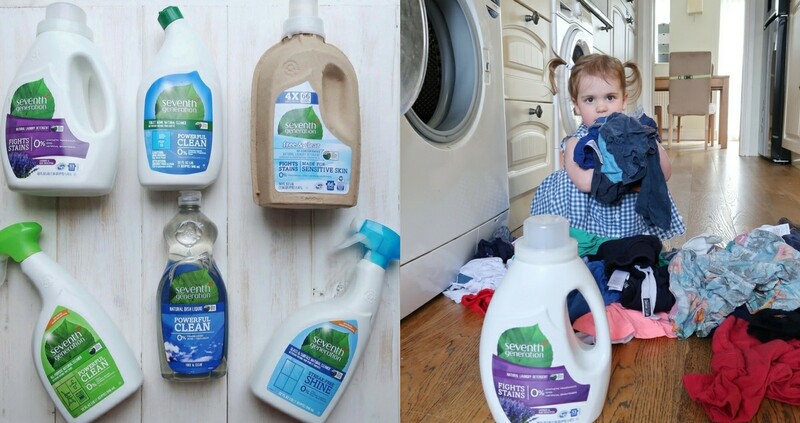 You can buy Seventh Generation products at Tesco and if you use the discount code GRXN7Y you can get £3 off laundry detergent, even if you don’t win! If you would like to be in with a chance of receiving a hamper of Seventh Generation goodies, enter below. Please note, terms and conditions apply and can be found in Rafflecopter. 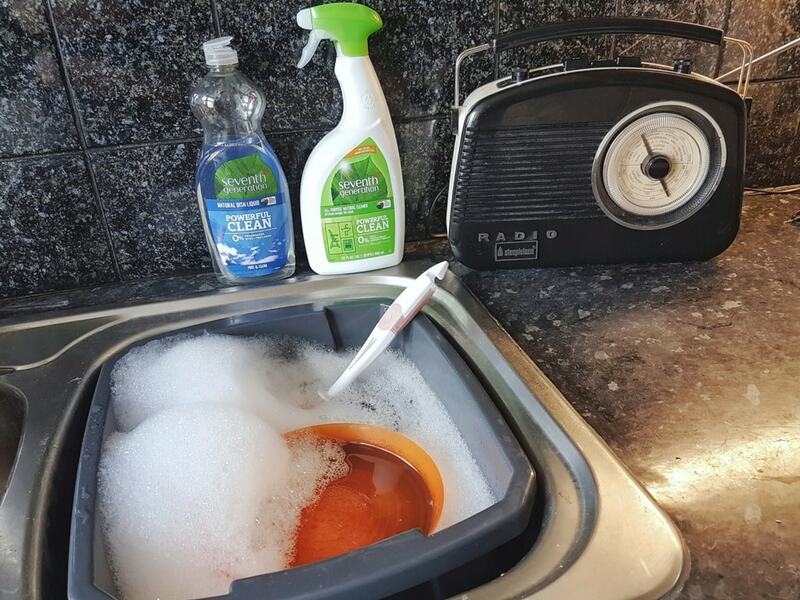 This post in in collaboration with Seventh Generation and they kindly sent us some cleaning products to try. It is very important to me as my eldest daughter and I both have alergies. Very important – I want to buy cruelty-free products. It’s all impotant to me to use eco friendly cleaning and beauty products. I’ve tried the 4x concentrated laundry liquid and I agree it’s fab. It is very important to me as my son suffers from allergies. i try my hardest to do my part for the planet, there are enough people out there ruining it, so i like to think even the little things I do are a big help. It is important, in order to protect the environment. It’s very important. I don’t want to use products which may harm me or the environment. It’s very important to me that the cleaning products I use don’t contain harsh chemicals that could harm the environment. Very important and it is something I have become more and more aware of since having children. I think it’s super important to try and buy eco friendly and sustainable products in order to make the planet healthier for the future generation! It has to be an important factor in choosing cleaning products that they don’t dirty up and pollute the earth after they’ve been used…it’s really common sense or what is the point I guess? It is very important to use only eco friendly cleaning products in my house and have been doing so for years now. I prefer to use eco friendly products where I can. it is really important to me as i really care about the world. Very important. Safer and better for myself and my family. There is so much toxins nowadays. I try to buy environmentally products of all kinds when I can, but for cleaning, the results are an important consideration and many eco-products underperform so badly that they do more harm than good. So I’d be very interested in trying these. I like to buy natural and eco-friendly cleaning products whenever I can, however money is tight and I often find these products very expensive and can’t always afford to pay extra. It would be nice & I would buy them if the cost wasn’t too great. I like to buy eco friendly products, but my partner is rather fond of her Mr Muscle, there’s no getting round it. I’ve never tried them before, but I’d like to. Very important as have new baby on the way! I would prefer to but price depends. It’s very important as I don’t want to damage the environment or my my family’s health with chemicals! We only have one planet so very important! I worry about the children breathing in lots of dangerous chemicals. It’s very important, especially as I have a lot of small furries in the house and therefore need to make sure I am not poisoning them! I’ve never really thought about it. It’s something I should look into. It is something I find important. However, I can’t say I always stick to buying it because being on a budget I often find \i have to get whatever is affordable that week. Fairly important as long as it is reasonably priced. Love eco friendly! And the youtube videos are fab, always looking for new ideas for the kids! P. S. My twitter is @ebonysellers13, im not on it as zoe! It is extremely important to me as the world is sadly already being poisoned with chemicals, including us humans and animals. The more natural the better in my book. try to buy natural products when given a choice. It’s important to me so I can try and protect my family and the environment naturally. It is important but sometimes finances dictate that I buy non eco friendly products. I do wish they were cheaper! Very as harsh chemicals make my sensitive skin play up.no.end. would love to try these. Very important, I hate the idea of putting anything down the drain that could harm wildlife. It is extremely important to me that products are not tested on animals and that they are organic. It is very important. Thanks for the chance. My whole family are chemically-sensitive so it’s very important to me. Really important especially for kids. I always prefer to buy them if I can. I must admit it isn’t something I’ve thought about too much, really should be paying more attention to what I use! The more I read the more it is. I could do with these, moving out of my current abode and I’ll be seeking vegan-friendly products for the new one. I love the fact that we are getting more choice on environmental products. Hopefully the support for these products will be there so they can carry on icreasing their ranges. I much prefer eco friendly products but I still have one or two mainstream brands that I haven’t managed to wean out of my routine yet. My pet peeve with big non eco brands is normally the synthetic scents they use which can be quite overpowering. At the moment it isn’t essential for me to be honest – a good price would probably win. I think I need to be educated a bit more about the available brands and benefits. I want eco friendly products for my home and my family. I also want what’s best for the environment. Very important, I like to choose eco friendly products and not tested on animals but cost is a factor too. I do try to buy natural products that are free from chemicals both to help the environment and also because my daughter has really sensitive skin with her eczema. Only wish they were more reasonably priced. As every years passes, it becomes more important to me to play a more active role in choosing the best green household products. I tend to be more concerned with the quality of what they do, rather than if they are natural or eco-friendly. Still I would like to give these a try. It is difficult for me. I manage holiday cottages and provide the cleaners for them all. We have to ensure that we are careful about using anything that might aggravate allergies but also need to ensure things are sparkling clean. These products might be the answer. Its very important as I have Asthma and most cleaning products irritate me & I believe its better for my granddaughters I don’t want them ingesting harmful chemicals. It’s important for me to buy natural and eco-friendly cleaning products as I have eczema and really sensitive skin. Some products we’ve used in the past have aggravated my condition. Just wish that they could be slightly cheaper so more people would use them. It is important to me, but I do have to balance out cost vs environmentally friendly because I’m on a budget. It is very important to me and I try to be very eco-friendly and recycle etc. Its extremly important in our house. Both my daughter and I have a lot of allergies and at 6 due to issues she puts everything in her mouth plus it teaches them that they can get rid of dirt and grime without the need for harmful chemicals. I think it’s definitely a bonus if a product’s eco-friendly. It’s important to me to try to use eco friendly products where I can, so long as they do the job and I don’t have to use large quantities to get results. It’s important to me as my son has eczema and I don’t like the thought of all the chemicals that are released into the water system each time we do some washing.